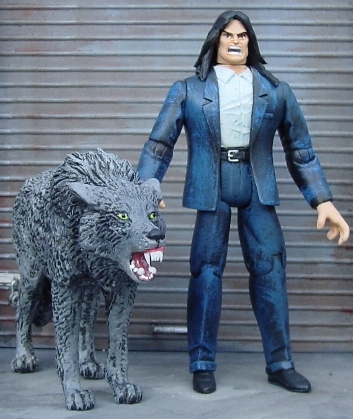 AL KRAVEN & NICKEL: DragonballZ figure with a Juggernaut head. The hair is a blend of the Box set Thor's and the Box set Thunderbird's. The shirt is Sculpey. Nickel is a PVC wolf that was adjusted and modified with Sculpey. PVC fangs and teeth were also added.